Rockingham Flames (SBL) tabbed 31-year old forward Greg Hire (201-102kg-87, college: Augusta). It is actually his comeback to Flames as he has played here before. Hire played recently at Wildcats (NBL). In 33 games he averaged just 2.0ppg and 2.9rpg this season. Hire helped them to win the league title. 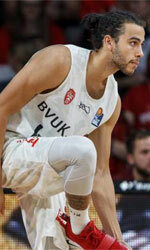 The last summer he played at Flames where in 24 SBL games he had very impressive stats: 18.5ppg, 13.6rpg and 6.0apg. Hire contributed to his team making it to the semifinals. He has played previously for Wanneroo. Hire attended Augusta University until 2010 and it is his ninth season in pro basketball.